Stingers topped Bandits for the first spot in WEBL. They posted a 62-54 win to improved to a 2-0 record. Lyndi scored 10 points and grabbed 10 rebounds to help her team take down the number 1 team. Dynasty meanwhile edged Lady Elite 64-58. They celebrated the initial win, while Lady Elite remain winless so far at the tournament. Bandits and Stingers won 2017/18 openers beating their opponents in the first games. Bandits overcame Dynasty 54-49. 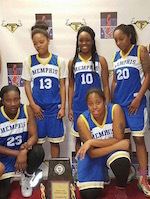 Ryven Jackson (5'10''-G/F, college: Talladega) top-scored for the winners with 18 points, while Tammy Heard replied with 12 points and 9 rebounds. Marianne Kursh led Stingers past Lady Elite. She scored 19 points for the winners in their opener. Bandits win WEBL Play-offs 2017 beating Stingers in the Final game. They proved their ambitions of the first-seeded team to secure the title. Rayven Jackson became the 2017 WEBL Champion as she added a 2017 WEBL MVP title. Earlier Bandits overcame Knights 81-67. The Stingers that finished the season second beat third-placed Lady Elite 77-60.